In this episode: A simple podcast for a quiet, post-funeral Friday. Frivolity will return next week. Or, even sooner if you raise a glass to Vera right now. Not just for beginning sewists, the Schoolhouse Tunic by Sew Liberated, and the Clover pants from Colette Patterns. The Lady Gray Coat I aspire to is here. Two books that should be on every sewists shelf: Fast Fit, by Sandra Betzina and Pants for Real People, by Pati Palmer and Marta Alto. Seriously. These women taught me everything I know about altering patterns to fit one’s shape. It’s not hard, it it makes the difference between wearing a finished garment, or not. This week’s Audible Choices are Hunger Games sequels Catching Fire and Mockingjay, by Suzanne Collins. click the log below to sign up for your free book today. Music by Enter The Haggis, One Last Drink, from the cd Soapbox Heros. Loved hearing you talk about the Singer. My mother had one of those, she updated back in the 70’s and instantly regretted it. I loved the buttonhole gadget, I remember playing with the dies when I was small. I recently was given a 60’s era Singer Slantomatic, and I’m loving learning how to sew on it. For some reason it’s just more fun on the old machine than on the nice modern Brother I picked up many years ago when I first decided that I needed to add sewing to my repertoire. Condolences over the loss of Tonia’s mum. I just lost my dad unexpectedly after a sudden, rare illness. Still feels surreal. Raising my glass to Vera. My condolences to you and Tonia. But what a wonderful photo! 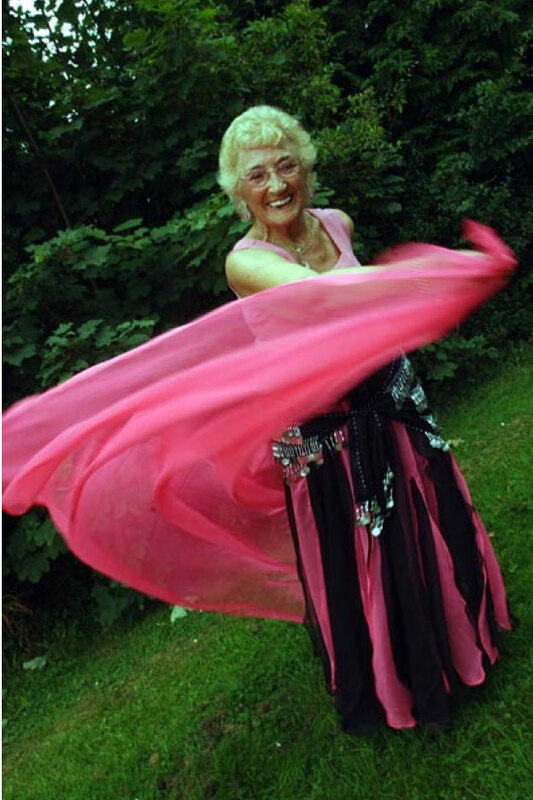 I’ve been bellydancing for ten years (I’m in my mid-thirties now), and I certainly hope I’m still doing it when I’m in my eighties! Vera sounds like she lived well indeed. Raising the home-bottled beer to Vera. Love the picture, she certainly enjoyed the moment. I know about Feather-weight love…I’ve had mine for a long time and through many relationships with ex-girl friends that didn’t think it was worth taking when they left. Little did I know how much love could be packed into one little sewing machine. I made all of my 35 yo daughter’s school clothes (Remember “Jams”), her cloth dollies, and her prom dress on that machine. Hugs and prayers for you, Tonia and the rest of your beautiful family. I found this episode so touching. What a lovely way to remember a lovely lady. I have my mom’s Singer Featherweight–slightly older than Vera’s–and many of the memories you spoke of are near to my heart. Thanks so much for your beautiful podcasts. Thank you for a touching ‘cast. Rewound and raised a glass. To Vera. To the space that parents leave, to be filled in with memories that come fast at first, then slowly for the rest of our years. Quiet hug to Tonia. Brenda, if you can wear the Clover pants, you can wear a Lanesplitter skirt! Just sayin’. My deepest condolences on the passing of Tonya’s mom. I love the photo of her! She looks like a wonderful woman! When shopping for fabric in the US, you should stop at Treadle Yard Goods in St Paul, it’s just down the street from the Yarnery (okay, down a mile or so) where you’re teaching! It’s a shop dedicated to natural fiber apparel fabrics, and amazing. Deepest condolences to Tonia. I must admit, Tonia’s mum looks like she was a right hoot. I’m sure she’s shimmying her stuff up in heaven right now. My mum always swears by Singer. She worked as a seamstress for numerous years. I remember my grandma having an ancient treadle Singer when I was little. It was old even then, 40 years ago. She also had a hand one too. Don’t know what happened to them after she died, but they were all in perfect working order. First, I’d like to offer my condolences. What a wonderful photo! Thanks so much for the sewing book recommendations. I’m having trouble finding ready made blouses I like and have been considering sewing my own. I even already have one of the books you suggested! Now to read it and sew. I also own a Featherweight, although mine was gifted to me and doesn’t have all the features you mentioned. I LOVE it for piecing quilts. And thanks so much for the music in the podcasts! You’ve introduced me to several songs I wouldn’t have come across otherwise and really love. I’ve just listened to the episode. My condolences to Tonia and you, losing someone is rough. I enjoyed hearing about your Singer. I have a White sewing machine that predates yours by about 10 years. It was my mother’s, and all it does is sew forward and backward, nothing fancy. It’s got a buttonhole attachment, too, which I’ve used a lot. It’s quite entertaining to watch the needle move through the buttonhole template plate, and the buttonholes are perfect. Finally, I thought the name Pati Palmer sounded familiar. Sure enough, I unearthed a book called “Easy, Easier, Easiest Tailoring,” by Pati Palmer and Susan Pletsch as I was sorting through stuff in my yarn room. It’s from 1977, and I think I must have taken a tailoring class from them around them. Definitely good info! What a beautiful, spirited woman in this photo. She looks like a friend I would love to know. Thanks for sharing. No affiliation, just a member of the yahoo group on Featherweights.